Printed railcar covers provide a means for protecting lumber and wood products while utilizing a large advertising medium in the shipping process. Often, graphics are a secondary concern when considering the application of a railcar cover; a large print is usually considered a “bonus” to the fact that a customer needs to cover their products for protection. There are options for Flexpak to manufacture a high graphic print on railcar covers. Flexpak specializes in custom design and hybrid covers, and this does not stop with railcar covers. 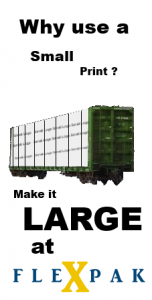 Large prints and high graphic advertisement on rail lines is the next step when shipping by railcar, and Flexpak leads the industry with custom solutions for large shipping covers. Printing can be utilized on either the Sewn Railcar Covers or the Heat Sealed Railcar Covers. There are different design options for print. Large continuous print across the entire cover, or selected repeat can be viewed along the sides of the railcar cover. Contact Flexpak at any point to discuss how printing on railcar covers is an excellent way to reach a target market with a large print, while maintaining the protective properties of a cover in the shipping process.